Did you ever really think about how it must feel to be discriminated against as someone with Tourettes? Well, an amazing Dublin Theatre Festival show offered an education, injected with a serving of comedy and a fair amount of swearing on the subject. Backstage in Biscuit Land has been described as “Life changing” by some in the Twittersphere and as “delightful,” by Stephen Fry – but if you can’t appreciate the odd swear word, you might have been better off missing this Axis Theatre, Ballymun. Jess Thom, who also goes by the name Tourettes Hero, takes the audience on a trip through her mind as she describes life with Tourettes in a surprisingly light-hearted manner. Jess, from London, says the world ‘biscuit’ 16,000 times a day and she also hits her chest in sporadic movements out of the blue. These are just some of her ‘ticks’ – but the performer certainly doesn’t let them get her down. In a wonderfully refreshing take on the syndrome often made fun of, Jess turns the laugh on its head and has fun with Tourettes herself. And the Ballymun audience embraced this attitude in a huge vulgar panto-like sing along and happily sticking their middle fingers in the air, as part of the fun of this relaxed performance. One thing is for sure, if you had a care going in to this show, it will have left your body by the time you leave. 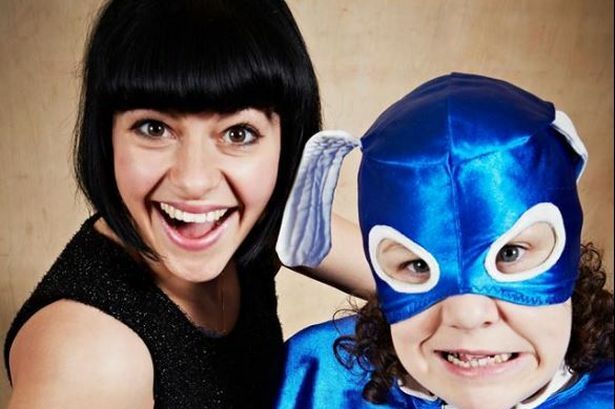 Jess is simply put, quite amazing – a wonderful woman who embraces her disability and makes it possible for those who are a little different to the majority, to become stars in their own right. She takes the audience on a thrilling ride as she describes how she was made to feel different at school, even isolated in the sound room at theatre performances, due to her random shouts, but how she then came to realise she could help others by just being herself loudly on stage. The show uses song, puppetry, and of course ‘tics’ and a helping of biscuits for each and every audience member, to transport you in to a land Jess makes seem fun and wild. And while she may have been discriminated against and finds it difficult to attend the one place she loves, the theatre – Jess has made her show open to all. As a relaxed performance, all are welcome to move round and most importantly, make noise, during the show. But of course, because she has Tourettes Jess will inevitably swear, so the show has been rated only suitable for 14 plus. Backstage in Biscuit Land ran for two days last week for the Dublin Theatre Festival. The show is now off to Australia. The only thing we have to say that went against the performance, is that it wasn’t in Ireland long enough. Log on to the www.dublintheatrefestival.com here for more shows up until October 16.